This plan was developed with the support of the City and Regional Planning Department at the University of Memphis through a Strengthening Communities Initiative grant. 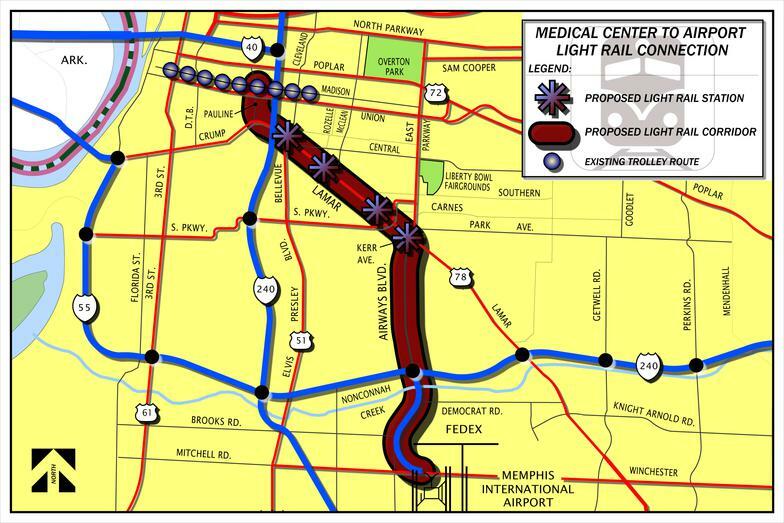 The purpose of this plan is to provide for the redevelopment of the areas bordering the transportation corridor from downtown to the Memphis International Airport following the route originally proposed for the light rail system along the Lamar Corridor from Pauline on the west to Airways on the east and along the Airways Corridor from Lamar Ave. to the airport. The recommendations included are gathered from residents, property owners and other stakeholders along the route. This plan will serve as a guide for future development including land use and zoning, commercial development, infrastructure, transportation improvements, public facilities, and public spaces. Other issues such as crime prevention, blight, and social services will be dealt with only as they are related to the recommendations for redevelopment and brought forth in community meetings, surveys, or personal interviews. The corridor included in this plan is located in the Midtown Planning District and the Depot Planning District. It includes portions of census tracts 35,62,63,64,and 69. The population, housing and demographic data will be taken from census block groups that most closely fit the neighborhood boundaries of the adjacent neighborhoods. The neighborhoods include Annesdale Park, Annesdale/Snowden, Rozelle-Annesdale, Glenview and Cooper Parkway along Lamar Avenue, as well as Bethel Grove and Alcy Ball along Airways. The current pattern of development is primarily residential with commercial nodes at Bellevue and at Airways. Lamar is currently zoned highway commercial (CMU-2) with the exception of the portion from Willett to McLean, which was rezoned local commercial (CMU-1) in a previous plan completed by the Pigeon Roost Development Corporation (PRDC) in 2005. Airways is also zoned CMU-2 with several light industrial (I-L) sections. The surrounding neighborhoods are residential. Several neighborhoods have overlays or historic status: Historic Conservation District for Rozelle-Annesdale, Annesdale Park, Annesdale Snowden and Glenview are National Historic Districts. Many of the neighborhoods have active neighborhood associations and the Pigeon Roost Development Corporation and the Alcy Ball CDC are active in neighborhood redevelopment. A community is defined by a variety of indicators serving to identify the place and to provide opportunities for social interaction. Various elements, landmarks, pathways and way-finding devices, are interconnected to provide a frame of reference and to act as organizers of activity. Moving elements such as pedestrians and vehicular traffic use these elements as well as past experience to move through the community. Neighborhoods develop as distinct units through familiarization with the physical surroundings and the experiences associated with them. Physical boundaries identify an area which is usually a short distance from edge to edge as determined by the time required to move from one to the other. A central area may provide commercial or recreational opportunities for residents and serve as social centers increasing the sense of identity and security, supporting a connectedness for the neighborhood. Over time, individual and collective experiences build a history associated with the area; and, through generations of residents, the identity of the neighborhood becomes cohesive as a distinct unit . Transportation plays a major role in the development of a community both within and between neighborhoods. Lamar has served as a major route through the area for Indians, early settlers and current residents. With fewer automobiles during early twentieth century, transportation was largely by foot or public transit. While railroads provided local accommodation early in its existence, Lamar Avenue gradually developed as the route used for travel into and through the area. Public transit later became the primary means of travel used by residents. Numerous stops along the route promoted the growth of small shopping areas where residents could obtain goods and services for daily needs. The surrounding area developed into a series of distinct walkable neighborhoods connected by the commercial corridor. Following the end of World War II, the automobile rapidly became the principal form of transportation and shopping centers replaced the local small businesses causing a decline in the social connectedness essential to the well being of the neighborhoods. With the increased mobility afforded by the automobile, residents began to reject the nearby 'walk-to' shops. As they began patronizing the grander, suburban shopping centers and attending churches farther away, an erosion of the social connections which had built the neighborhoods originally paralleled the decline of the small businesses. This decline in social interaction was exacerbated by younger family members moving to suburban areas, which in turn hastened the exit of the commercial sector, the relocation of churches and civic institutions. These factors were central to the decline of the more affluent white population in the 50s and 60s. That decline became precipitous when the schools were integrated. The relative affluence of the resident populations plummeted. The housing stock began to show its age and infrastructure was neglected leaving some areas increasingly marked by blight. An even greater separation of neighborhoods ensued through racial and economic segregation. Public transportation was increasingly left to those without access to automobiles. The suburbs were mainly occupied by those with personal transportation leaving the inner-city areas to those without it. In effect, this separated the more affluent suburbs from the poorer inner city areas. The housing stock in the older neighborhoods required increased maintenance, often beyond the means of the incoming population. As the city and county officials concentrated on the new suburban areas, the infrastructure in the inner-city was increasingly neglected and declined accordingly. Vacant lots, empty houses and blight became more common while many of the larger homes became rooming houses with a transient population not socially connected to the neighborhood. Today, the Pigeon Roost area is marked by a variety of neighborhoods in various stages of decline or re-growth. The 1950s and 60s saw a decline in the housing stock and infrastructure as families increasingly moved out. Housing values decreased, but even at those reduced values redlining made it difficult to obtain mortgages. In the early 1970s many residents formed neighborhood associations to deal with the problems. A Midtown Council of Neighborhoods was organized to coordinate the efforts of the individual groups under the leadership of Wanda Goodman. These active neighborhood groups have accomplished much, revitalizing distressed neighborhoods' prospects for residential and commercial development. Such efforts were usually realized through the leadership of a few determined individuals who galvanized the government for the investment of public funds. As these funds were invested and improvements showed, private investors and individuals were increasingly drawn to these neighborhoods by improved housing and relatively modest prices. However, some areas of Midtown fared better than others. 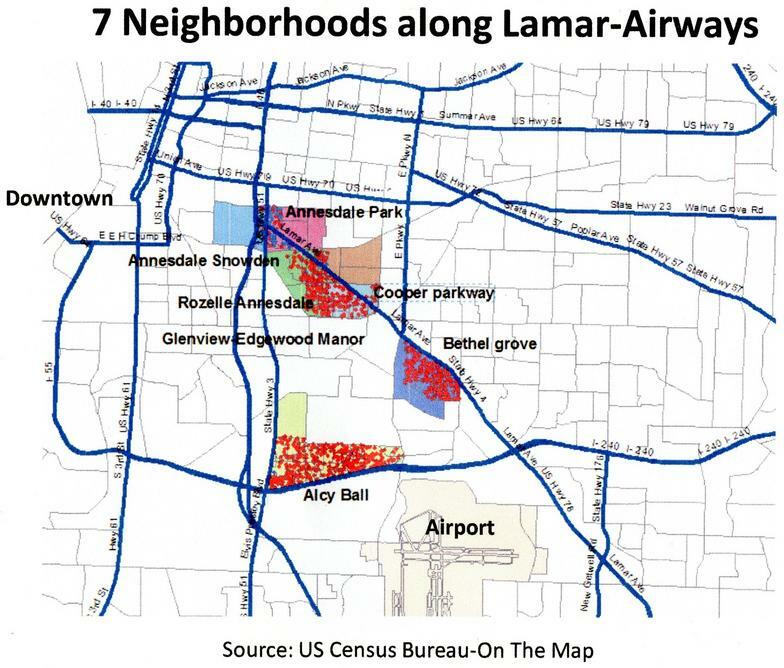 Today neighborhoods along the Lamar Avenue corridor are separated more by economics than race and are increasingly focused on their individual internal problems rather than working together to address challenges area-wide. Property is increasingly owned by absentee investors renting to the local residents. The result has been a transient population with little social connection to the neighborhood. Lack of common, central locations where residents from the different neighborhoods can meet, build relationships and develop trust has made it difficult to overcome the physical separation impeding revitalization of these areas. It is worth repeating that the small shopping areas along the transit corridor that once brought residents together in a social setting are diminished in stature or gone. These walkable commercial centers have largely deteriorated or disappeared, the corridor today serves more as a boundary separating the residential areas rather than serving them. Residents are further segregated economically into those with automobiles and those dependent on public transit. It is the purpose of the plan to address these issues through a Transit Oriented Development using a Bus Rapid Transit system along the corridor to connect residents with employment centers and to encourage locally focused commercial development at the transit stops. The route covered by the plan will follow the earlier proposed route for light rail; however, the PRDC plan calls for a bus rapid transit system rather than rail.